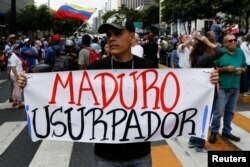 A man holding a placard that reads "Maduro usurper" takes part in a gathering with members of the Venezuelan National Assembly in Caracas, Venezuela, Jan. 11, 2019. 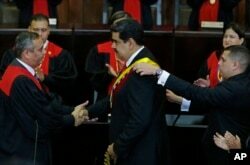 That's the same charge that landed in jail another up-and-coming opponent, Requesens, following a drone attack on Maduro in August. Juan Requesens has yet to have a public hearing, nor have prosecutors presented any evidence in the case. "I still have projectiles lodged here,'' he said.